At April 1st and 2nd, I’ll be teaching classes in Rennes. As part of the module: Corporate sustainability reporting. It is really helpful that I can use all the material and preparations of my colleague who went last year. The students will have to hand in an assignment at the end. Evaluating a company’s annual sustainability report using GRI and ISO standards/integrated reporting. The company will be assigned by the teaching staff. The third question on the assignment is on integrated reporting. Make an outline on the value creation story the company could tell. Applications of the materiality principles. In this part of the lecture I’ll introduce the elements of the concept of Integrated Reporting they need by applying it to my “business model me”. Make the link between The Story, The value creation process, the outcomes and materiality. And mentions 2 “points of attention”. Communicating clearly on the capitals you rely on. Telling well your value creation story. This is where Integrated Reporting comes into the picture. 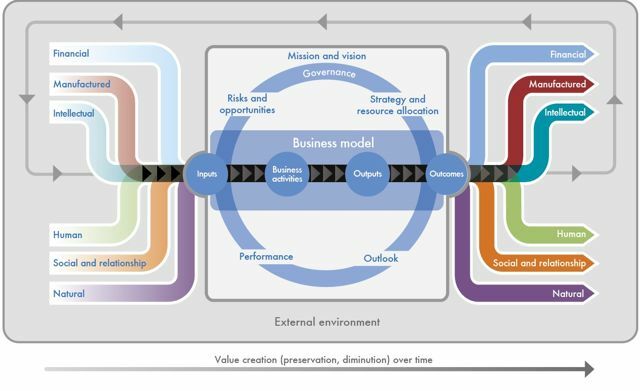 The International Integrated Reporting Council (IIRC) issued its framework for Integrated Reporting in December 2013 as a means to provide greater insight into the resources (the so called “Capitals” – social, natural and human as well as financial and manufactured) used and affected by a business. It seeks to explain how an enterprise interacts with the external environment and these Capitals to create value over the short, medium and long term. Ironically, Integrated Reporting isn’t really about reporting at all. It’s about integrated thinking, responsible business behaviours and innovation. And telling it like it is. it’s essential for the functioning of the economy as a whole. Resources include water or fossil fuels, renewable natural resources such as solar energy or agricultural crops, and the capacity of the world’s carbon sinks — i.e., the air, forests and oceans — to neutralize or sequester the waste generated by economic activity. When it comes to determining whether natural capital is material to an organization, relevant factors must be brought to bear. These include the level of reliance on natural resources, the environmental impact of its productive process, and what the organization has to do to operate within the limits imposed by the environment. Intellectual capital: encompasses the intangibles associated with brand and reputation that are critical to the organization. It also includes resources such as patents, copyrights, intellectual property and organizational systems, procedures and protocols. These can provide significant competitive advantages. They can also have disadvantages, such as the negative brand equity attributed to major polluters or ill-reputed shareholders. Human capital: refers to the skills and know-how of an organization’s professionals as well as their commitment and motivation and their ability to lead, cooperate or innovate. The success of an organization is tied to proper management of its teams and care for their motivation and well-being. Excessive employee turnover or inadequate remuneration policies can damage reputations and impair an organization’s ability to create value. Manufactured capital: mainly comprises physical infrastructure such as buildings or technology equipment and tools. Manufactured capital may be owned by the organization or by third parties, e.g., ports and other public infrastructure. They contribute to an organization’s productive activity. It follows that their efficient management can reduce the use of resources and drive innovation that leads to greater exibility and sustainability. The simplified version, my own value creation story. Telling the story is also linking the mission and vision to the outcomes. It’s a puzzle as to why reporters are going awry – after all, the Framework’s definition of outcomes is clearly worded: the internal and external consequences (positive and negative) for the capitals as a result of an organization’s business activities and outputs. In essence, the question to ask is what effect have you had on the capitals you use or affect by dint of being in business because these outcomes can affect your future inputs. Let’s make it small. What is my mission/why, am I creating value and what are the outcomes (!materiality)? Through which processes/roles am I creating value. I, Ilse Meelberghs, want to hold the space for people to connect with their Self, those of others and the natural cycle. Space in which people can evolve cyclic. Working towards a society in symbiosis with everything that makes our being possible. I translate this as: in general, which capitals do I affect and how. I’m minimizing the impact by buying less stuff, eat three days a week biological food, giving “garbage” back to recycle, buy green energy and have solar panels, drive a hybrid car. The relationships with family, friends, colleagues, students and part of the social media community matter most. I use the intellectual capital that others share to create learning processes. I use what I learned to support my children and students to develop their ability to learn, lead, cooperate and/or innovate. I develop and use my skills to earn money to support my family. Try to spend my money on people/products that are working towards a better world. Step 2: Application of internal relevance filters (impact). I translate this as: Where does the above connect to my mission statement. I hold the space for others to connect with the natural cycle, the cycle of life. I hold the space for people to connect with their Self, those of others. 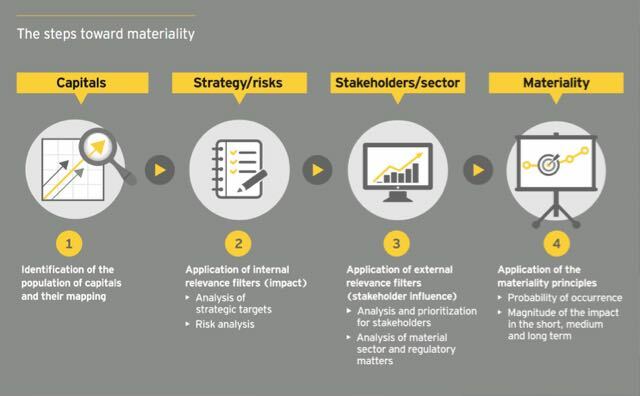 Step 3: Application of external relevance filters (stakeholder influence). Other teachers appreciate the learning I share on my blogs. My openness helped them reflect about their own work. I translate this as: what is the magnitude of the impact on the short, medium and long term. Clearly, the two capitals most affected by me are human and intellectual. The place where the impact is the biggest is as a teacher. Because once implemented, learning processes are executed several times. Another place where the impact is big is through my blogposts. develop the ability to learn, lead, cooperate and/or innovate. develop the ability of the participants to use their core qualities, stick to their principles. connects to the natural cycle. are a step on the way towards a society in symbiosis with everything that makes our being possible. Sharing in blogposts these learning processes and from which learning they are the result. The students are going to prepare the slides on question 3. I’ll want to be able to judge sources. 3 groups of students present their slides. I’ll provide feedback. What to take with me. Over Telling a trustworthy value creation story., Tonen = doen in contact met studenten.